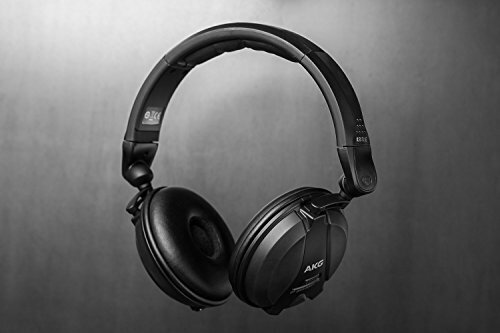 Boasting a variety of impressive features, the AKG K181 DJ UE stands out at its price point. With a maximum input power of 3500 mW, the robust 50mm drivers are well suited to meet even the most demanding PA speakers head-on. At 42 Ohms, this headphone pairs great and goes loud out of any source you throw at it. A mono/stereo switch and the swivel earcups make single ear monitoring a breeze, and the bass boost allows you to customize your listening experience. Turned off, you'll get a punchy and intimate sound that's not fatiguing in the least. Switch the bass boost on, and you'll hear thumpy goodness that adds growl and energy to the lower end without muddying the mids or highs. Pros - Secure on head; Built in bass boost. Cons - Extreme clamping force; Cheap look and feel; Overall mediocre sound quality. Pros: Secure on head; Built in bass boost. Cons: Extreme clamping force; Cheap look and feel; Overall mediocre sound quality. Tonal Balance: Warm with a downwards slope. I’ve been using the K183 as my primary cans for the past two weeks, using them rather heavily during the time with a wide variety of music and games. While I feel confident that I have a good feel for the sound and construction of the K183, this is still a subjective review and your personal experience may vary. Personal experience will always be the best way to form an opinion on a headphone, though I hope that my words may be of some help also. Well they look cheap and feel cheap, and the headphones creak when held, but they feel like the type of headphone that would put up with a lot of abuse. There are stress points that look ripe for the breaking, but I’ve beat these guys up with no stress fractures or damage shown. The headband did survive an intense stretching session as well, so there’s that. The mini XLR removable cable is a nice touch to durability. Easily the hardest clamping headphone I’ve ever worn. I had to stretch them over my clothing bin for 24 hours and even so, much of the clamping force is back. I’ve gone from pressure headaches caused in less than 10 minutes of wear to being able to wear them for 45-60 minute sessions at least. The on-ear design, combined with rather hard and uncomfortable pads don’t do much to alleviate this. They isolate well though, very well, so there’s that. These are definitely not for medium to larger sized heads. Using the Bass Shaker Test the K183 purr from the start with some small dips throughout, but nothing alarming. With the bass boost function on the bass is noticeably increased. Minor driver rattle in the left is heard. When listening without the bass boost on the bass sounds warmer than neutral, somewhat untextured though not sloppy. Midbass is punchy and the sub-bass is extended well. I find it very slightly intrusive into the midrange though not annoyingly so. Adding just a slight veil. With the bass boost on the sub-bass gets a sub-woofer like presence though the texture goes nearly out of the window. Midrange veil is emphasized to varying degrees depending on the recording, but it’s certainly noticeable even using the likes of Steely Dan. I can’t say that I’m a fan of this tuning, the bass nearly fatigues me on some tracks before the end of it. One positive is that listening to the bass boost and going back to unboosted gives a very balanced perception initially. The midrange is largely unintriguing to me. A bit dull, mildly veiled, moderately grainy. A bit congested as well. There’s a dip somewhere near the female vocal range causing the likes of Madonna to sound a bit hollow, and everything else sounds a tad fuzzy here. In photography terms, the midrange is not sharp, rather a bit soft. There’s slight added sibilance, and a bit of brightness in the treble region. Treble seems well extended, but carries some of the softness in detail retrieval that the midrange carries. Bass boost amplifies my disinterest in caring about the midrange. Sibilance seems slightly softened, but the bass is well overblown for any sort of alternative rock, or well anything that relies on the midrange. With bass boost on I find that the midrange seems excessively soft, lacking any punch when listening to something like Rage Against the Machine. Not entirely closed off sounding, but lacking hard edges of separation. There’s a resemblance of depth here, even if only slightly, and width isn’t completely closed in, but these are definitely closed. Good left/right signals but there’s little in terms of imaging quality outside of basic left/right and a hint of in/out. The AKG K181 DG left a bad impression on me, rather immediately, due to a pressure headache and they didn’t do much to impress me from them on. There are too many flaws to make these an everyday tagalong can, and even when they do excel, which I find rare, they don’t do so to a degree of magnitude enough for me to recommend them. For $76 they wouldn’t make a bad closed back to carry around, but I have a very hard time recommending them over the Audio Technica M50x which, to my ears, sounds like a more versatile headphone and is far more comfortable - Yes I understand how weird it is to hear M50x and comfortable in the same sentence.